White capped and lively – the frothy white head of this distinctive nitro brew softly cascades into bright gold. The first sip reveals a smooth velvety taste with a light wheat character and hints of orange while an undercurrent of peppery spice adds a bright finish. Bought 3/4/2016 enjoy by date on the can was 6/2016. Open the can and it sounds and pours like a Guinness Draft or Guinness Nitro IPA, fun to watch settle. L: Nice rich light orange color, nice carbonation action with the Widget and nitro gimmick, excellent head. Takes a few minutes to settle to be able to taste. S: Spices, hint of banana, does not carry into the taste. F: Creamy and heavy, like a Guinness Draft or Guinness Nitro IPA. 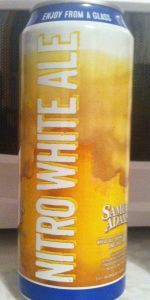 The "creamy," smooth, feel is awkward, and not pleasant with this Wheat Ale style beer. O: All I can say is, this was an unpleasant experience and, possibly first time ever, I poured it down the drain. Even as a BOGO at a local market, IMO it is not worth the $11 for a 4 pack, even when buy one get one free. This is not the typical quality or distinct flavors other of Sam Adams products. A: Pours a cloudy/murky honey orange in color with moderate amounts of carbonation (after the initial nitro cascade) rising slowly from the bottom of the glass and faint golden yellow + copper highlights. The beer has a finger tall creamy foamy bright white head that slowly reduces to a large patch of thick film covering the entire surface of the beer with a thick ring at the edges of the glass. Moderate amounts of lacing are observed. S: Light to moderate aromas of wheat + pale malts, citrus/orange peel, and spices (coriander). Very light notes of Belgian yeastiness. T: Upfront there is a moderate flavor of wheat malts with a light presence of pale malts. That is followed by a light to moderate flavor of Belgian yeast and a light flavor of citrus/orange peel and spices (coriander). Light amounts of bitterness in the finish which fades away pretty quickly. M: Medium bodied with a moderate amount of carbonation. Smooth and creamy. O: A pretty decent example of the style and probably the first time I have ever had a witbier on nitro... Easy to drink with well hidden alcohol. Enjoyable. A — Pours a pure white ball of foam into the glass, it does cascade and settle into a pure clear yellow body of beer with no visible rising bubbles but a pure white head of foam sits on top and leaves behind some okay rings of lacing. S — Smell is incredibly muted and mellow, not much going on, maybe some light graininess and cereal malts, but not much else. T — Much like the nose, this is very muted, with just some light grainy notes and a bit of a yeasty tang, really mellow, smooth, and unassuming. M — Light in body, very smooth on nitro, very monochromatic and borderline watery. O — OK overall, probably the worst in the new Nitro Can series though. Super disappointed. The beer looks unpleasant, but is made up for with the pillowy head. I want a literal pillow made of this. Smell is pretty nice. Orangey and beer-like. The mouthfeel is what gets me. It's flat - a white doesn't seem to stand up well to being put on nitro. Taste is fine, inoffensive, and mild. If it had even a spritz of carb then I'd enjoy this. 16 oz nitro-can poured into a Sam Adam’s Perfect Pint glass. Cloudy golden orange with excellent nitro cascading action. Leaves behind 1 finger of tight laced head with great retention. Lemon, orange citrus, doughy bread, wheat, and coriander. Lemon and orange juice. Doughy bread, wheat, candy sugar, and honey. Bouquet of coriander, lemongrass, and orange zest. Medium-light bodied, ultra-smooth, juicy, and refreshing. The nitro works beautifully with a Witbier. A home run for Sam Adams and the Nitro project. I knew my rating was going to be an positive outlier. Creamy, hazy, pale orange color. Wheaty flavor, with hints of bitter orange and coriander, as expected per style. The nitro gives the beer a nice velvety twist, but it is still crisp and refreshing. Sam Adams definitely nailed what they were trying to accomplish with this. All around solid wit, with a unique twist on the mouthfeel. F - Creamy, but still thin. O - Its basically a nitro Sam Summer, and we did not need that. Tastes more like a generic macro lager with a nitro widget in the can. Nitro was too gimmicky here and did not enhance the experience. The base beer tasted bland at best, but it still had its moments of being undrinkable (especially as it warmed up).